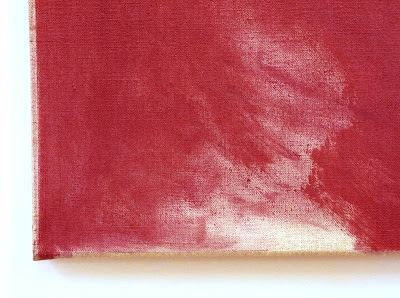 A Spring a thousand years ago, 2012; glue tempera on cotton, 72 x 44 in. and I was seized by fear. You are a spring a thousand years ago. Standing in front of this painting, I felt swept into a space of time and mists, so similar to the feeling of Chinese landscapes. Sorgin, 2013; oil on linen, 21 x 15 in. The paintings are paradoxically both rich and hardly there. I sense great care in the making of the work, and yet there's a feeling of freedom in its brushwork, freedom that comes from practice and from close attention. In this detail you can see how Zurier uses the dry brush and thin paint to make subtle layers of depth, all illumined by the light coming from the canvas beneath. I am made more aware of his attentiveness by the edges of many of the paintings; in Sorgin there is a very light line at the left edge. It seems that Zurier deliberately folded the corners of the canvas to have them expand outside the rectangle, little dips of irregularity. This is why I photographed all the paintings on the wall and did not crop them close. Hellnar, 2012; distemper on linen, 108 x 75 in. Even though it's a vertical painting, Hellnar has a strong sense of a landscape space, like A Spring above. It is a soft and distant landscape, one just out of reach. 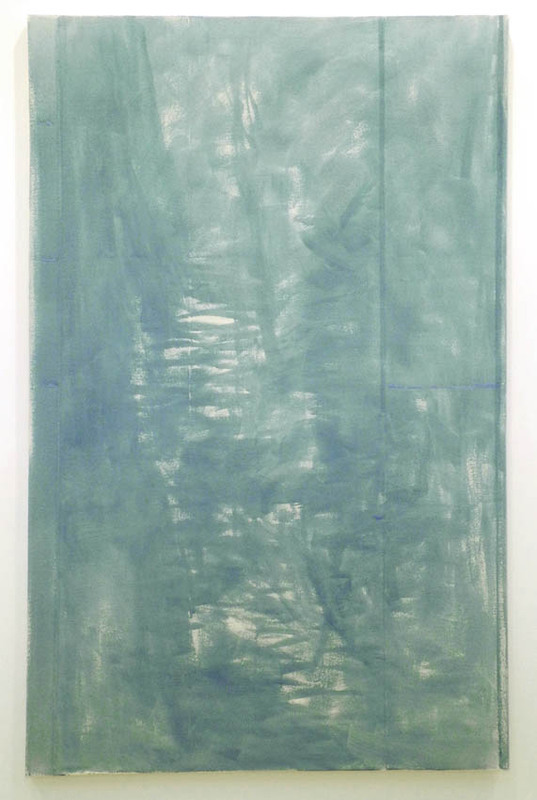 Another interesting aspect of Zurier's paintings is that even his larger work feels very intimate; it is enveloping and meditative. In this detail, you can see that Zurier again calls attention, subtly, to the edge. 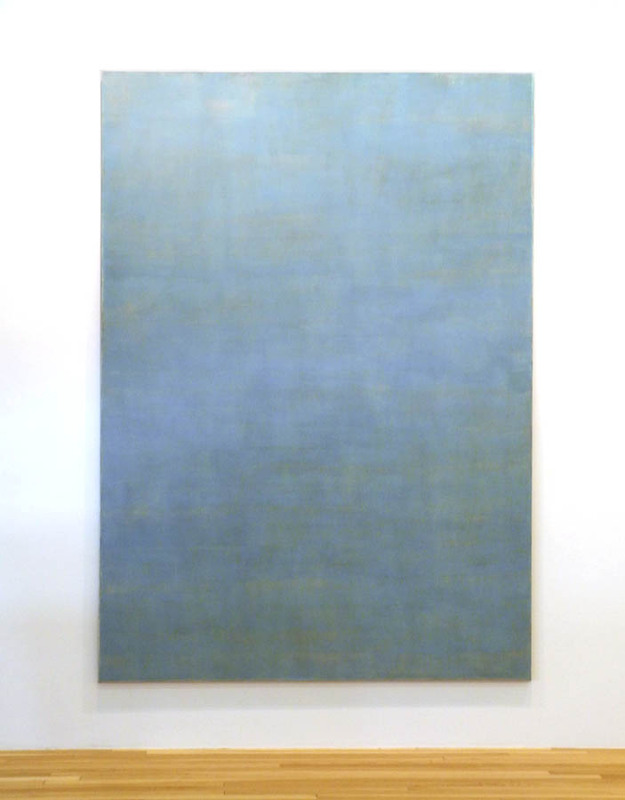 All his paint is subtle: thinly applied so that the texture, and often the color, of the linen canvas shows through. Some of the paint he works with is an ancient technique of distemper, which is pigment mixed with a glue size as a medium. 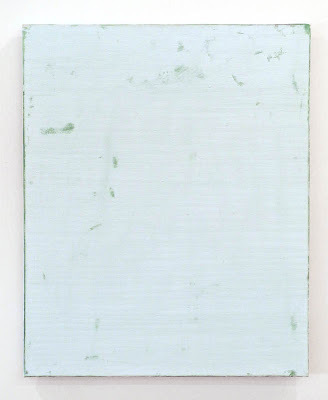 The paint tends to be thin, which suits Zurier's sensibility well. Mosfellsbœr, 2012; distemper and oil on linen, 26 x 21 in. 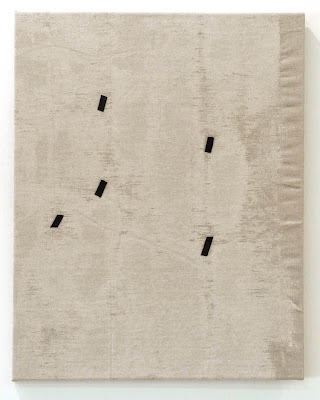 In this small, very different composition, small black bars dance on the grayed surface, marking places but ready to move and shift. 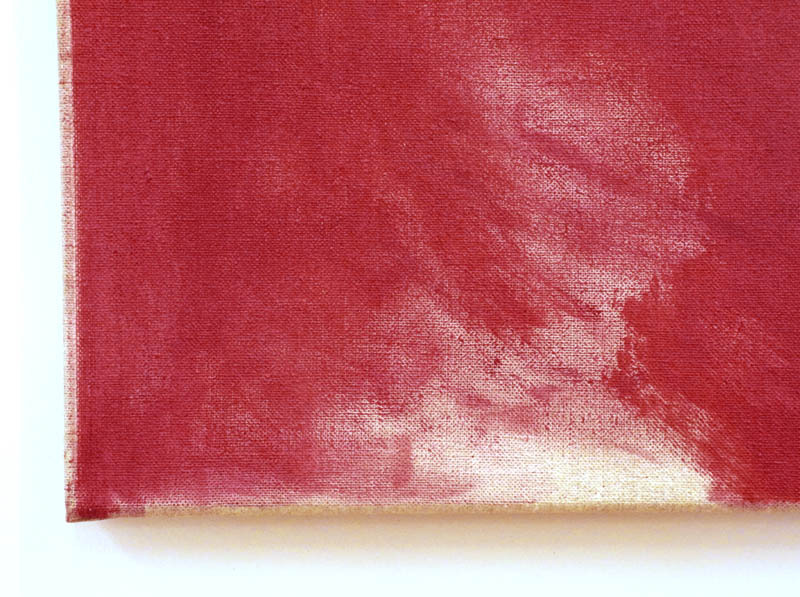 The unpainted right edge of linen is puckered from the shrinkage of the painted portion; veins run across the surface, the paint is there as if to indicate an aerial landscape. 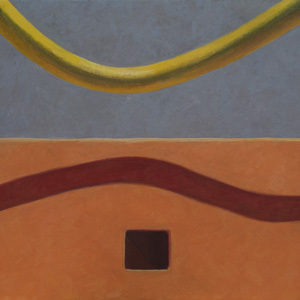 Oblaka (for Mark), 2007; oil on linen, 38 x 31 in. 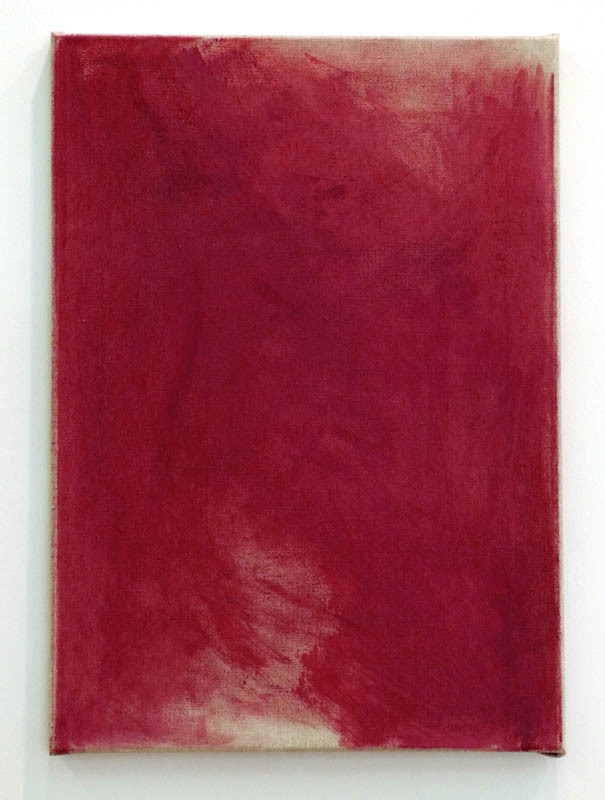 One of the things I admired about this show was the variety of approaches to making a painting; Zurier explores paint and surface, with each painting having a character of its own. 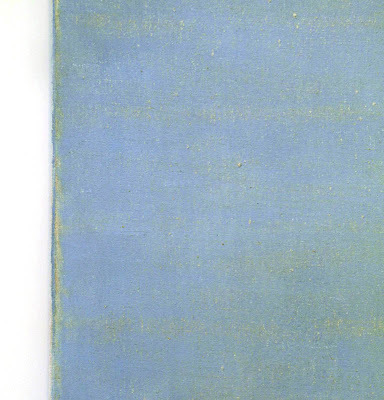 Oblaka is like something hidden, with time-worn abrasions poetically revealing color. Vonin, 2012; distemper on linen, 18 x 22 in. 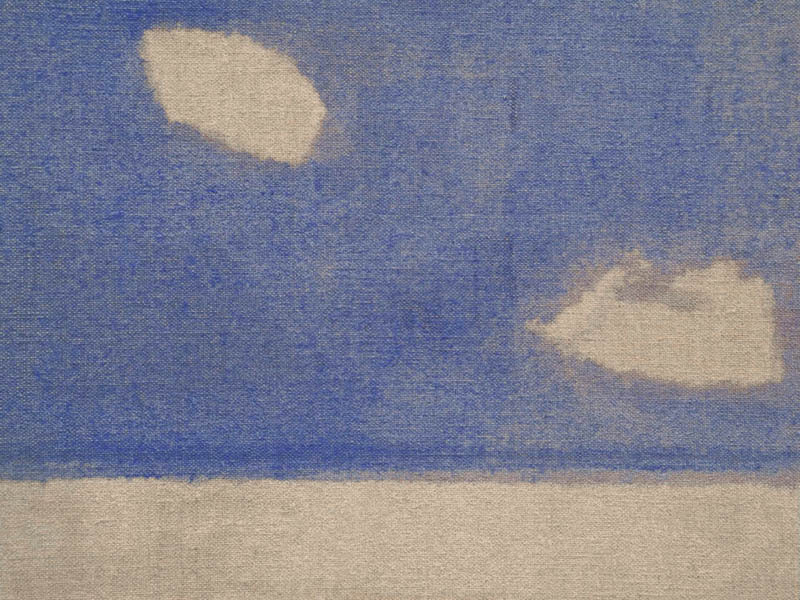 Within a simple band of blue, some shapes: islands? clouds? or simply irregular forms floating, but bound to the unpainted linen ground. 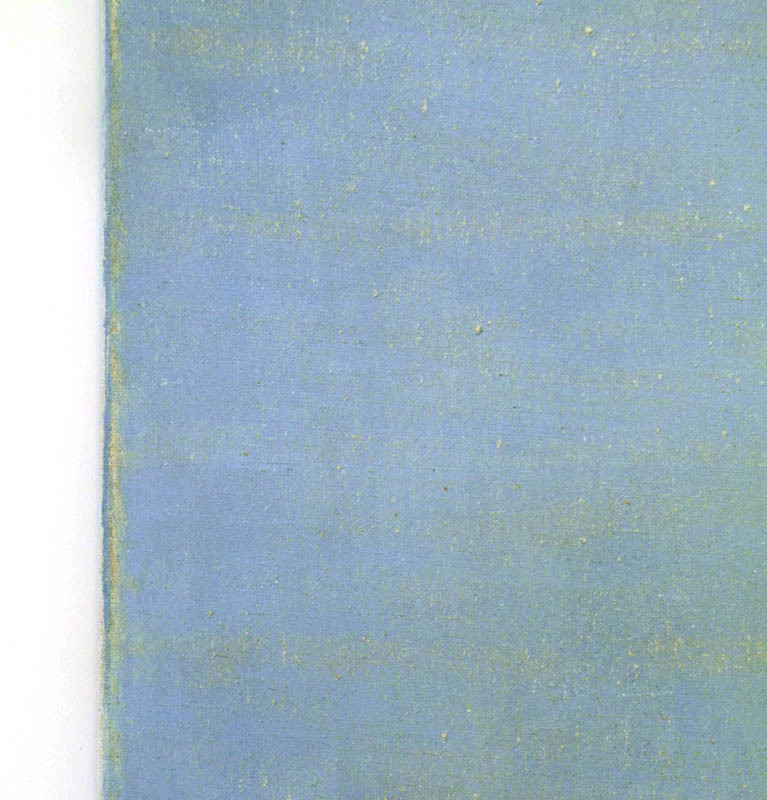 The distemper paint puddles and catches on the texture of the linen, the brush gently indicating forms, varying the transparency of blue. 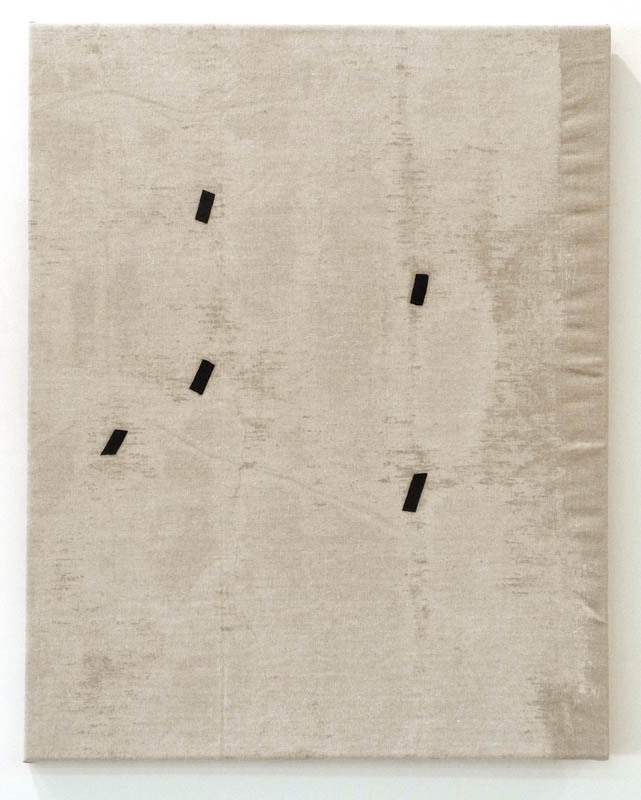 Hӓrnevi, 2013; distemper on linen, 75 x 108 in. Each painting in the show, whether big or small, is the right size for what it has to express. That is also true of Hӓrnevi, the largest painting in the show. 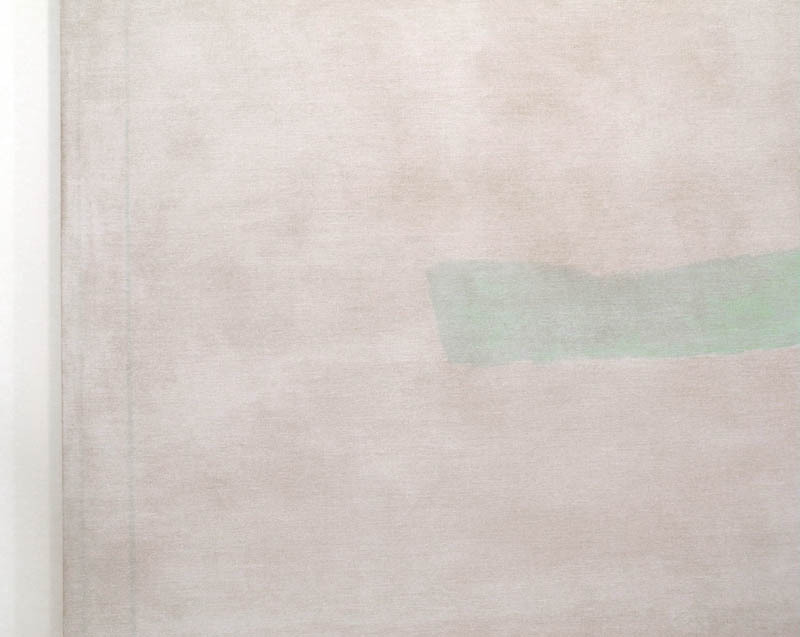 Across the large expanse of dark linen white paint is brushed on in varying degrees of transparency, creating a shifting cloud-like space that is seemingly endless and deep. 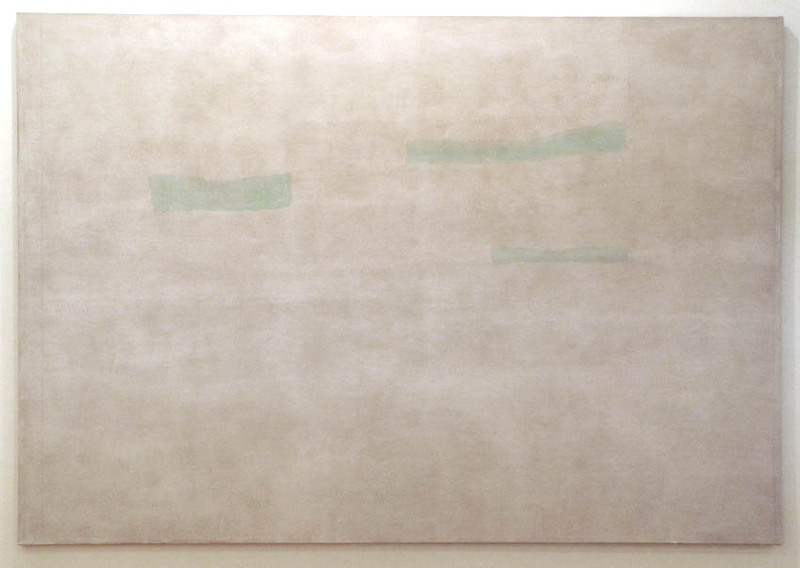 Within this field three irregular green rectangles float, beings in nothingness. Zurier again calls our attention to the edge, with thin painted green lines: the atmosphere has a boundary, it is not infinite. 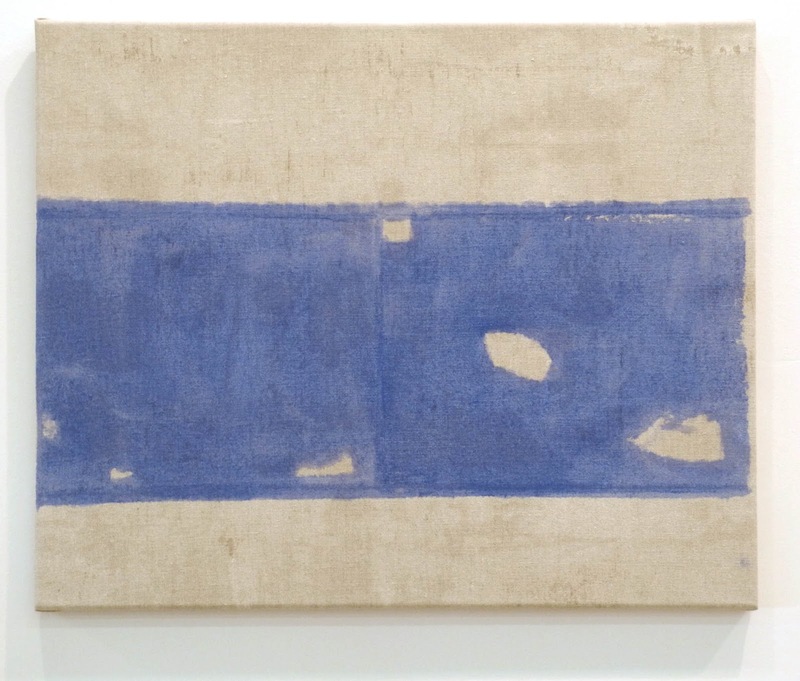 In this beautiful exhibition, these seemingly thin and fast paintings are truly deep and thoughtful and slow. Your generous gift here introduced me to a wonderful painter. As we dig in the dirt, nice to be reminded of more ethereal pursuits. You're very welcome, Julie. Yes, it's wonderful to have varied pursuits, each with its rich reward. I love these too. Thank you for posting; I would never have seen them or heard of them, I think, and they are sticking with me in a lovely way. 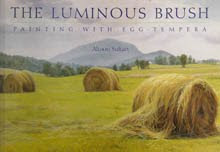 Susan, I'm so glad you like these paintings; it was wonderful for me to discover them. Thoughtful appreciation of compelling work! Thank you craig; I'm glad you like the post and the paintings. A New Textile: "Sixteen Circles"
A New Painting: "Yellow Peak"